Mirador (n) (Spanish) watch tower or look-out point. Cadiz is one of the best places in the world to find miradors. As the destination port of the Spanish ships from the Americas, it was where the treasure, of all kinds, not just silver and gold, came ashore. Much of the city was engaged in some form of trading so it was in everyone’s interest to be able to see the ships returning. Many of the grander houses, homes to wealthy merchants, had their own mirador, from which to watch for the ships as well as see what was going on in the busy harbour. 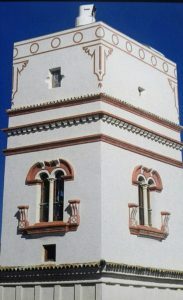 The Torre Tavira, named after the first official watchman of Cadiz, Don Antonio Tavira, was the official watchtower, on the highest point in the city (only 45 meters above sea level). It has, as you can see from the photograph on the right, a camera obscura on its highest floors, which enables visitors to see all of the city and much of the Bay besides. I have climbed this tower many times (and believe me, it is quite a climb, there is no other way of getting to the top than to climb the stairs) and the view is stunning (see Wanted: Book Researcher ). The Torre’s web-site carries much better pictures than I could include in this post. 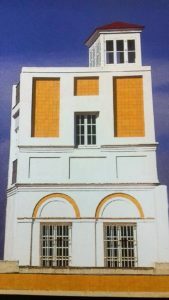 For opening times and charges also see Torre Tavira. 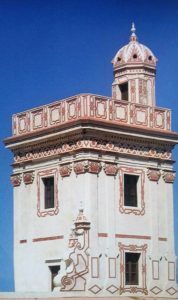 The miradors are predominantly from the 17th and 18th centuries. They are usually a square addition of several floors on to a house, though there is at least one octagonal tower. 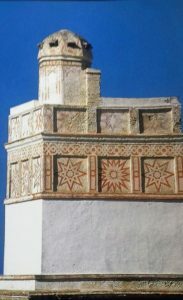 The architecture, like much in Andalucia, owes a lot to its Moorish past with its typical arched windows and patterned tilework. Cadiz currently has 126 miradors, fewer than in the past. At the height of trans-Atlantic trading it had as many as 160. The city council banned the construction of more in 1972 as the cost of up-keep was high and some existing towers were in danger of collapse. The name mirador is derived from the verb mirar, to look, or to look around. Thus it is a place for an activity, whereas it’s close cousin, belvedere (from the Italian) is a more passive name for a similar piece of architecture, denoting a beautiful view. Its Spanish equivalent is bellavista and the root of both is the Latin videre, to see. They are both viewing platforms, though Belvedere has also come to mean any high viewing place. 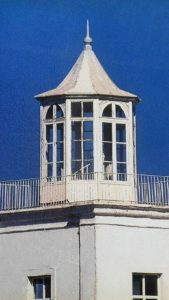 The miradors of Cadiz, though beautiful, and giving the city a very distinctive look, were places with a function, one closely linked with commerce not just a place to see a fine view. This entry was posted in Culture Vulture, From a Foreign Field, History and tagged Foreign field, History by juliej. Bookmark the permalink.